Brown areas on this map indicate areas where the forest greenness is much different than its expected greenness for the given date. These areas have very likely been damaged by gypsy moths. Image credit: Pasquarella et al. Oct 5, 2016 • [by Janet Lathrop, UMASS Amherst] Valerie Pasquarella, a postdoctoral fellow with the University of Massachusetts Amherst’s Northeast Climate Science Center, recently released a series of new maps showing the magnitude and extent of damage from the current gypsy moth outbreak in southern New England. Using time series of Landsat images, she generates predicted images based on a model fit to historical Landsat observations. These predicted images are then compared with actual images acquired on a given date, creating a series of difference maps that capture and quantify the damage. “It’s a straightforward process of subtraction,” she explains. “It’s characterizing atypical patterns in forest vegetation condition over large areas, plus tracking through time, which yields near-real-time monitoring of disturbance.” Pasquarella has mapped eastern Massachusetts, Rhode Island and some of eastern Connecticut, comparing model predictions of vegetation “greenness” to actual observations for several dates in July and August. Where traditional monitoring of gypsy moth damage to vegetation has been done with aerial surveys that take hundreds of hours by pilots in small planes criss-crossing the state once per season and technicians later hand-mapping areas of disturbance, a new Landsat image is acquired every 16 days and automated algorithms for extracting change information are now available. Pasquarella says a couple of factors have made working with Landsat images easier and more fruitful recently, paving the way for such analyses at the intersection of imagery and ecology. 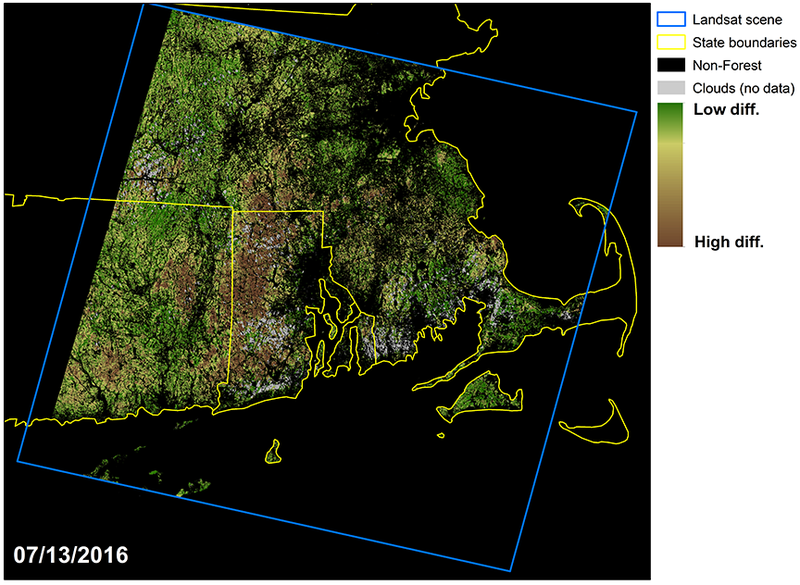 First, Landsat images that had once been prohibitively expensive became available for free public access in 2008. 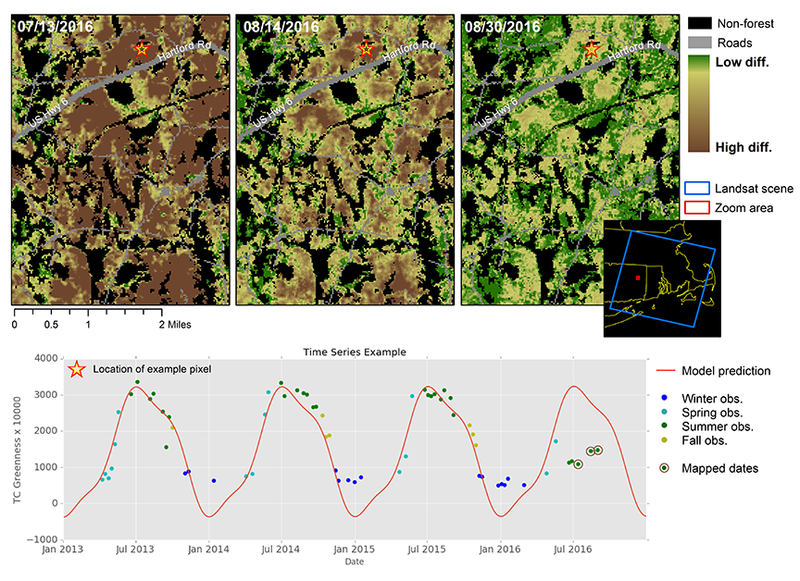 But with few analytical tools designed to work on time series of Landsat images, it was still difficult to make use of the complete Landsat record for a given area. The data analyst says that Landsat hasn’t typically been used to monitor temporary, event-based or short-term occurrences, but she calls the capability an “exciting new use for this sort of analysis.” Surveying conditions rapidly and repeatedly “are two ways of getting a snapshot of damage over large areas and a level of detail that an aerial survey can never achieve,” she notes. Pasquarella recently finished her Ph.D. with Curtis Woodcock at Boston University using Landsat time series to improve mapping of forest communities and monitoring of wetland changes associated with beaver activity. A series of maps showing the difference between expected (modeled) forest greenness and actual forest greenness based on Landsat observations. Credit: Pasquarella et al.